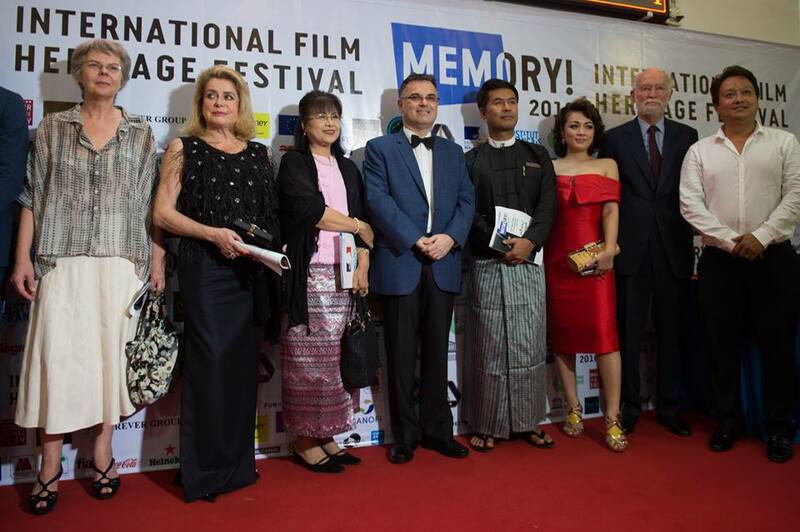 Guests of honour Michel Hazanavicius, Pascale Ferran, Catherine Deneuve, Grace Swe Zin Htaik, The French Ambassador to Myanmar, Wyne, Phway Phway, Nicolas Seydoux, Davy Chou, and other local and foreign dignitaries joined an enthusiastic audience for the opening of the 4th edition of Memory! International Heritage Film Festival. The festival was declared open by Award-winning actresses Catherine Deneuve and Grace Swe Zin Htaik. The red carpet ceremony was followed by the screening of freshly restored Myanmar silent classic Mya Ga Naing (1934) by director ‘A1’ Maung Tin Maung, featuring a live accompaniment provided by Hein Tint & his famous Hsaing Waing Ensemble along with Berlin musicians Meike Goosmann and Steffen Weeke. The original soundtrack is brought to life by Hein Tint & his Hsaing Waing Ensemble, joined by Meike Goosmann and Steffen Weeke. Thanks to the Goethe Institut, Yangon.